From daily rentals to repairs, local and visiting cyclists alike can get moving with a visit to Hwy 58 Bicycles. Locally renowned as Emerald Isle's only complete bicycle shop, Hwy 58 Bicycles has been providing the Crystal Coast with sales, repairs, and rentals – complete with exceptional customer service – for more than 25 years. The shop is a premiere spot to pick up a new ride, thanks to a showroom that expands for more than 4,000 square feet. 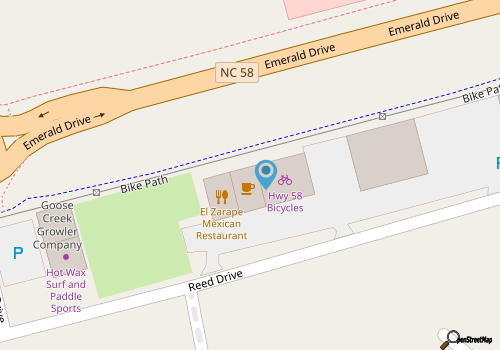 In this large area, shoppers can peruse a wide range of Jamis and Nirve Bicycles, which come in all styles, colors, and sizes for riders of all tastes and skill levels. In addition, the bike shop has an in-house fleet of more than 300 bicycles, which come in varying sizes in order to outfit the entire family with a safe and steady ride. Located along Reed Drive just a minute or so away from the bridge to the Emerald Isle shoreline, this bike shop is also effortlessly easy to reach for visitors staying throughout the western regions of the island. Great for riders of all ages and abilities, Hwy 58 Bicycles is a one-stop shop for every Crystal Coast vacationer who loves a great ride. Call (252) 354-9006 for current hours.